Earlier this year, Stone & Wood once again invited friends from inside and outside the beer world to their Byron Bay home for the annual brewing of their Stone Beer – the one that involves heating volcanic rocks from Fiji in a fire on the driveway before dropping them into the kettle then transferring the liquid to the fermenter. Matt King, our Crafty Pint SA, was there to ensure the brew went smoothly by drinking beer as it took place up, right up until the rocks were added not too long before midnight. 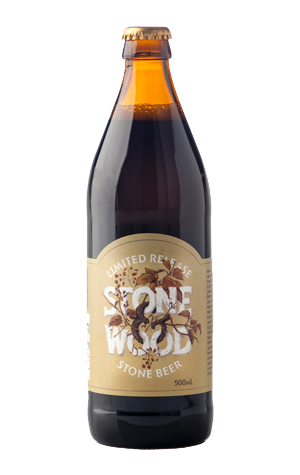 The beer was launched at the brewery's Festival of the Stone in Byron Bay and is set to appear nationwide following its Melbourne launch at Surfari during Good Beer Week. When it comes your way, you can look out for a different beer to those that have come before. It's lower in ABV than the past couple of vintages and features a new recipe based around the use of 11 (count 'em!) different malts alongside some old school Euro hops. What's their mantra? Keep it simple – pah! The result is almost porter like, softer and maybe even fuller on the palate than past years. The softness carries through into the aromas and flavours too: Swiss milk chocolate, mocha, Ovaltine, hazelnuts and a toasted backend to dry things out.